Goodreads Synopsis: King Midas once had the ability to turn all he touched into gold. But after his gift—or curse—almost killed his daughter, Midas relinquished The Touch forever. Ten years later, Princess Kora still bears the consequences of her father’s wish: her skin shines golden, rumors follow her everywhere she goes, and she harbors secret powers that are getting harder to hide. Let me start off first by saying this is a gorgeous cover! This alone made me want to pick it up. Then I was told it was a King Midas retelling – intrigued I haven’t read one of those yet. Lastly, I heard there were pirates. Then I just had to pick it up! I had to know how a King Midas retelling became a pirate story. Lucky for me I wasn’t disappointed. Now let me just say this, I have never read the story of King Midas, but I knew the basics – everything he touched turned to gold. 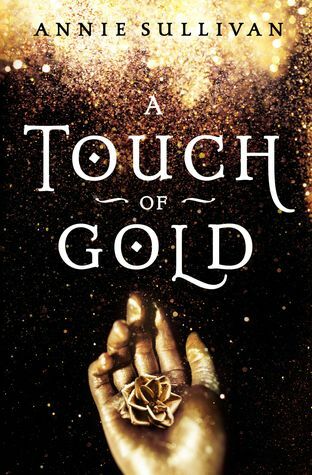 So I do not have the context necessarily of how closely A Touch of Gold follows the story of King Midas. However, I do not feel that this affected my enjoyment of the book. Without going into spoilers, I will attempt to tell you how much I enjoyed this book and why. It will be hard because I want to share so much about this book, but I want you to go experience the book yourself! First, the characters. I LOVED Kora and her cousin Hettie. Kora is such a beautiful character with such love for her family. Hettie is your typical “spoiled” girl who loves to be waited on and loves to eat all things fancy. Duke Aris Wystlinos is Kora’s most recent suitor. I found myself not trusting him throughout this book – he just seemed too understanding and put together. When Kora leaves to track the treasure, you met an interesting bunch of characters. You will meet twins, Phipps and Thipps, who I found to be the sweetest and funniest characters in this book. Brus is an untrusting sailor who is extremely superstitious – of course that means I don’t like him. The captain of the ship, Royce, was so standoffish that I wasn’t sure what to make of him, but suspected he would play a larger part in Kora’s story. Another character I will mention is Rhat, who seems to be Royce’s first mate. When we first meet Rhat, I found him adorable – and there is no rhyme or reason for it. I just decided he was sweet and smitten. Annie has a way of writing a story that makes you fall in love! I loved her characters and I felt invested in the adventure. I found myself laughing and crying and swearing at different points throughout the story. I can picture the ship and, with the descriptiveness of Annie’s writing, I was able to experience Kora’s connection to the gold treasures. Looking back, I cannot think of a part of the book that I disliked. Annie writes beautifully and I fell in love with the characters. I wanted adventure and she delivered. If I was to complain about anything it would be the fact that there wasn’t more. But really is that a complaint? There will be another book filled with more adventures – I am assuming because I refuse to read the synopsis of Book 2 – this series is an auto-buy for me so does it really matter? Needless to say, I highly recommend reading this! It surpassed my expectations. If you do get a chance to read this November 23/24th, we will be discussing it over on the TBR and Beyond Facebook Group. Annie has already done her live chat there, but you are still able to view the video – she is too sweet and funny. Great review! I loved this book so much as well!